Who doesn’t love kabobs? It’s a fun way to have dinner. No matter what the season is, it’s my family’s favorite. I love to see everyone simile whenever I tell them we have kabob, grilled vegetables and yogurt dip cacik, for dinner. 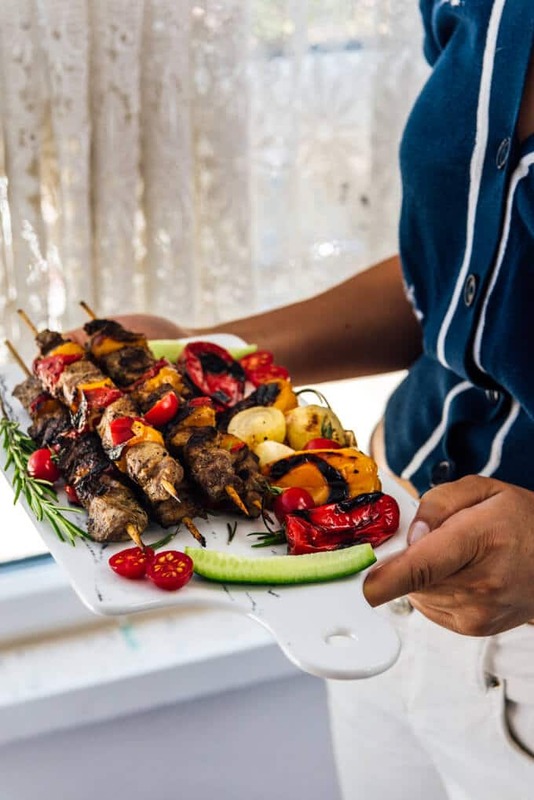 We either use chicken or lamb on skewers using the same marinade and have the same tasty and tender result each time. 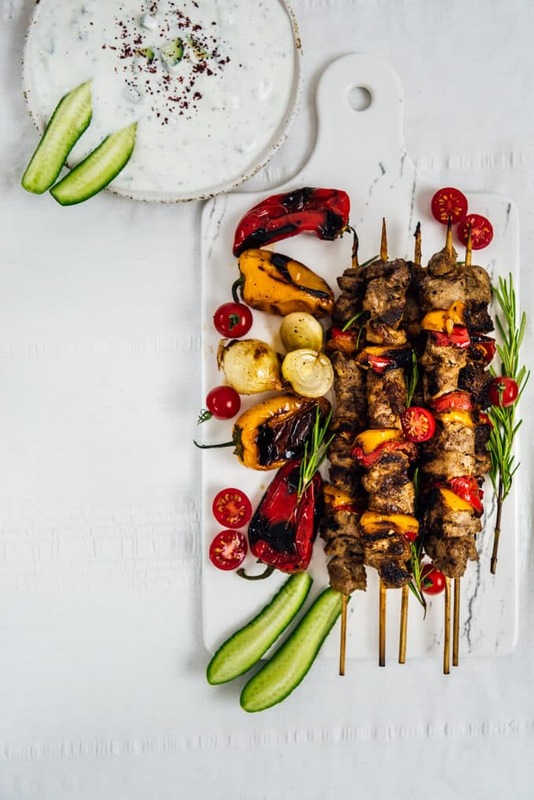 What I love most about this shish kabob recipe is that it can be prepared ahead of time. Super time saving! Another thing I love about making kabobs is that you can pair them with what vegetable you like. 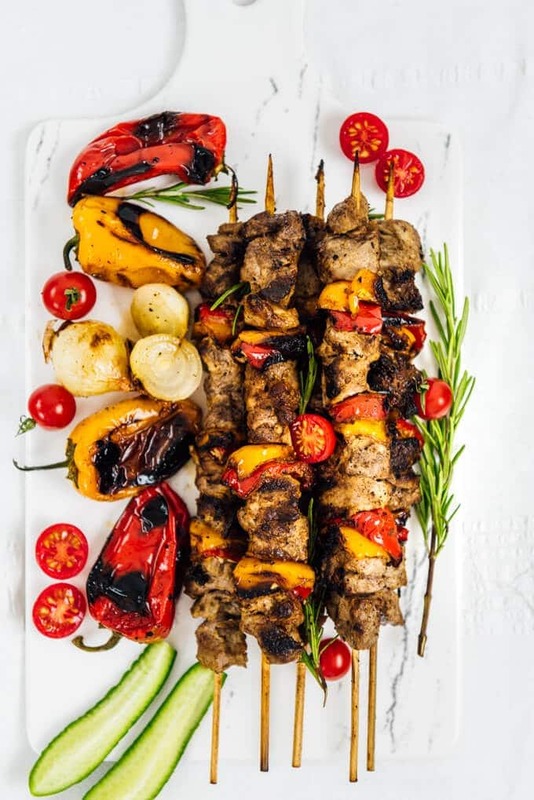 You can just thread them together on skewers or place some extra veggies on the grill and cook them altogether. I love grilled peppers, so I always pair kabobs with them. Our son’s favorite is grilled onion, so we always put some onions on the grill too. Oh and I add some fresh rosemary on the grilling kabobs. They all smell so good! And my husband? He loves anything grilled. He says he can eat any vegetable when served with meat. Besides vegetables, you can even grill some fruit as well and make your kabobs look even fancier. I forgot it when we made these ones, but I sometimes grill peaches or pears as well. Although we love Grilled Peaches for dessert, they go wonderfully with kabobs as well. It looks like a big feast when we put everything on the table although what we have is nothing but simple foods that are all grilled. You must see how we devour everything in some minutes. Yes our hands get dirty, but who cares? Isn’t it another thing everyone loves about kabobs? For an easy shish kabob recipe, I mostly prepare the marinade and put lamb pieces in it overnight. You know how it feels when you’ve already decided what to cook for dinner on the next day. Knowing that I have marinated meat in the refrigerator makes me feel like a super mom. This is a simple combination of yogurt, olive oil and spices. We use cumin, black pepper, dried oregano and a little chili powder but you can add extra spices that you think go well with lamb. In addition to spices, you can flavor your marinade with garlic. That’s what mom always do. Personally, I don’t want that strong flavor of garlic on the rich flavor of lamb. On the other hand, it works great with chicken or beef, so I add it when I prepare the marinade for these. If you don’t have time for an overnight marinating, refrigerate the meat in the marinade for at least 1 hour. This will still change the things a lot. Tender and juicy lamb kabobs thanks to a simple yogurt marinade. In a large bowl, whisk all ingredients for the marinade. Add in the lamb pieces and toss to coat. Refrigerate overnight or at least for 1 hour. Thread the lamb cubes and pepper pieces on skewers. Light a grill and place the skewers and throw some fresh rosemary leaves over them. Grill the skewers over high heat, turning every 1 minute to cook all sides. They are done within 7 minutes. Serve with grilled vegetables or fresh salad. If you are planning to grill vegetables to serve with these kabobs, grill them first. You can cook these skewers in a cast iron pan as well.